The Environmental Review Tribunal hearing into North Stormont’s approved Nation Rise wind turbine project has been adjourned until September 10-11. The adjournment was called by tribunal chair Maureen Carter-Whitney July 31, with three days remaining on the original two-week schedule. Key issues in deciding whether authorization given to EDP Renewables for the wind farm should be revoked are that it poses serious risk to human health, or that it could create irrevocable damage to the natural environment. When the hearing resumes, hydrology will be the main topic. 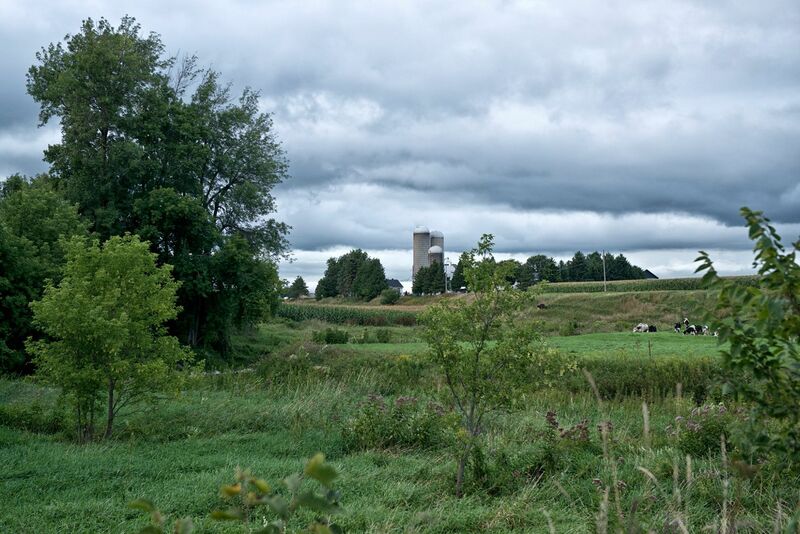 Before it broke, opponents presented their case on the threat to bats and birds posed by the installation of 33 turbines in the farming community south-east of Ottawa, the last wind power project to be approved in Ontario before the recent provincial election. Expert witness Philippe Thomas, a resident of nearby Chesterville, educated the panel on barotrauma, a phenomenon which can cause the lungs of bats to implode when they fly in low-pressure areas close to turbine blades. He described a study in Western Canada where it was part of his job to retrieve 400 bat carcasses at the base of wind turbines; only a few showed injuries consistent with being struck by blades, while the majority would have succumbed to barotrauma. [Opposition coordinator Margaret Benke] indicated opposing witnesses brought forward some fresh points on wind turbine noise and on “debris fling” — the fact that pieces sometimes break off wind mills and are hurled long distances, posing a threat to humans in the area. A major issue now, she emphasized, is paying the $20,000 debt opponents have accumulated in going against the project while raising more money to continue to fight to the end. To help with fundraising for the North Stormont appeal, go to Go Fund Me here or send a cheque to Concerned Citizens of North Stormont c/o Wind Concerns Ontario, PO Box 509, 250 Wellington Main Street, Wellington ON K0K 3L0. In a bizarre fight which sees ordinary citizens marshalling scarce after-tax dollars to fight the Ontario government’s environment ministry to try to protect the environment (and safety and health), the Concerned Citizens of North Stormont begins its appeal of the 100-megawatt “Nation Rise” wind power project tomorrow, July 23rd. The appeal goes before the quasi-judicial Environmental Review Tribunal, a panel that is part of the Environment and Lands Tribunals (ELTO) of Ontario. Almost every single wind power project in Ontario has been appealed, but there have been few victories in a system apparently set up to favour the power developers. Most successful appeals were won on blatant risks to wildlife and the environment, and one on aviation safety (the completely insane Fairview Wind project, planned between two airports near Collingwood). The power developer, Portugal-based EDP, is represented by John Terry of international law firm Torys LLP; Mr Terry has also represented the wind industry lobbyist and trade association, CanWEA, in the past. The new environment ministry, now the Ministry of the Environment, Conservation and Parks or MECP, will also be represented by a team of lawyers. The citizens’ group will be represented by lawyers from the environmental law firm of Eric K. Gillespie. The community concerns filed with the Notice of Appeal include the danger to the area water supply (most of the project is on a “highly vulnerable” aquifer), safety from turbine operations, and health impacts from the noise from the industrial-scale wind power generators/turbines. Tomorrow’s appearance will consist of Opening Statements, and a series of presenters including mechanical engineer Vern Martin, who will discuss safety concerns posed by the wind turbines and blades. Tuesday, the themes are noise and health, and public safety, with Wind Concerns Ontario president Jane Wilson presenting data on the thousands of noise complaints lodged with the Ontario government which have not been resolved. Engineer William Palmer will present information on turbine events in Ontario related to debris and ice throw from the turbine blades. Thursday will see appellant presenters discussing the risk to the aquifer and local water wells, posed by the foundation construction and wind turbine vibration. The proceedings will take place in the Finch Community Centre and Arena, beginning at 9 a.m., and are open to the public. Fund-raising for the citizen effort to protect the community is ongoing, please see the Go Fund Me link, here. One might think that he meant the approval process was so rigorous that wind power projects should pose no danger to the environment or to people and that’s why “this,” the successful Ostrander appeal shouldn’t have happened. But no, what he meant was, the rules and procedures attached to wind power development were supposed to be so iron-clad that mere citizens acting on behalf of the environment, wildlife and their own health, could have no hope of success. Lawyers acting for appellants have said, the test set up by Regulation 359-09 to prove serious harm to human health and serious and irreversible harm to wildlife was impossible to meet. Except, now, that test has been met. 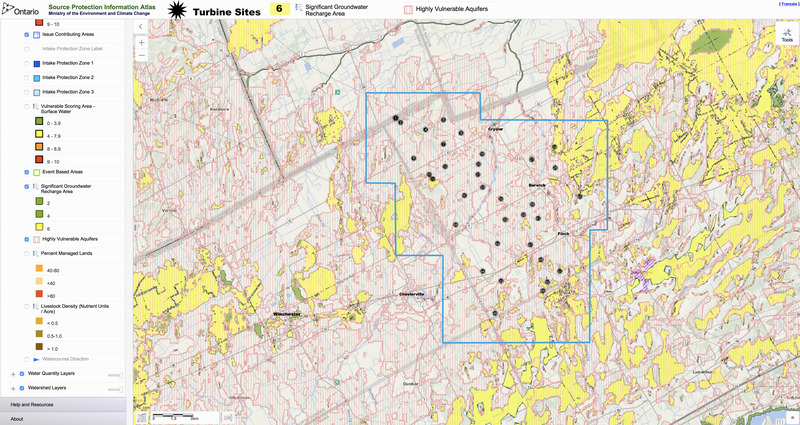 The successful appeals at Ostrander Point, White Pines, Settlers Landing and yesterday, Clearview, show that when proper attention is paid to the requirements to preserve the environment and actually balance development against potential harm, the wind power developments can be demonstrated to be in the complete wrong place. But the wind power development industry, coached and encouraged by their huge lobbyist and the very compliant Ontario government, felt entitled to propose wind power projects wherever they found willing landowners. Such was the case at Clearview where the eight, 500-foot turbines were to be located near not one, but two aerodromes, the Collingwood Regional Airport and a private airstrip. WPD Canada felt so entitled to success and money that it believed it could locate huge turbines even where pilots’ safety would be in danger and where wildlife would almost certainly be killed. The Environmental Review Tribunal decision was released Friday, October 7: yes, there would be serious harm to human health because of the risk to aviation safety and yes, there would be serious and irreversible harm to the endangered Little Brown Bat. Although a remedy hearing is possible, the Tribunal expressed doubts as to the effectiveness of any measures proposed. The Tribunal used very strong language in places in the decision, saying “it would be trite to say …” or “it is obvious …” and they noted the federal Ministry of Transport’s carefully crafted opinion letter on aviation safety at the airport. The people of Ontario have despaired at times as wind power projects have been put in fragile environments, too close to people’s homes and workplaces, without any real demonstration of environmental benefit. Millions have been spent by ordinary citizens as they took on corporate Big Wind to defend—what? The environment against their own Ministry of the Environment. One lawyer for the Ministry has often been heard to say “wind trumps everything.” She is wrong, as this latest decision demonstrates. Actions taken in the name of preserving the environment must really do that, and not rely on ideology-based trite statements for justification. Ontario has still never done a cost-benefit analysis on its wind power program even though clearly, wind power has a high impact on the natural environment, on communities, and on the economy, without actual demonstrated benefits. Clearview was a victory for all Ontario, and the environment. 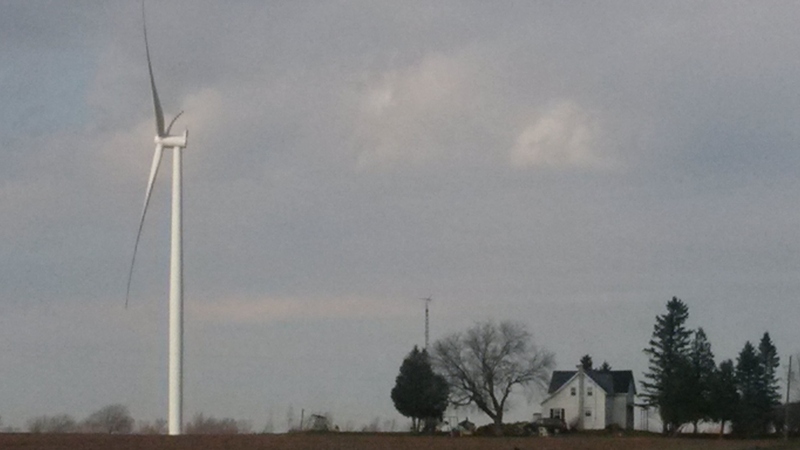 The long awaited decision of the Environmental review Tribunal on the appeal of a proposed wind power project at Ostrander Point in Prince Edward County was released yesterday. The Tribunal says that due to the clear danger to endangered species, the proposed project — approved by the Ontario government — is “not consistent” with the goals of renewable energy policy. PRINCE EDWARD COUNTY – It appears the gates to Ostrander Point are closed and there will be no turbines allowed entry. An Environmental Review Tribunal (ERT) issued it’s ruling early Monday, upholding an appeal of the nine-turbine project by the Prince Edward County Field Naturalists (PECFN), saying the installation of gates on access roads won’t adequately protect the population or habitat of Blanding’s turtles. In 2013, the ERT upheld the PECFN appeal of the REA to Gilead Power — the first time an appeal of an REA under Ontario’s 2009 Green Energy laws had been successful. A year later, an Ontario Court reversed the ERT decision, only to see the Court of Appeal side with the PECFN earlier this year, but did allow for Gilead to propose remedial action to circumvent environmental damage.